Draught skirt now with a new fitting system. 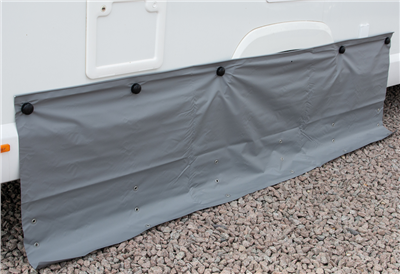 This skirt can fix to your vehicle through Limpet suction kit or caravan skirt rail using the integrated keder. Stop the draught from under your caravan. Available in three different sizes wth Limpets. Good quality product and will resolve the draught problem we were having coming through at the wheels location.